After an invocation by Matt Free, approximately 241 junior shaggers and their parents/grandparents enjoyed a fabulous brunch catered by the OD Shag Club. They ate while listening to the music played by DJ Larry Edwards. After brunch, all were entertained by a group of girls representing the Juniors and put together by Crystal Taylor Davis. Their song, “Trust In You”. Pastor Josh Walters of Mt. Pleasant Seacoast Church, gave an awesome talk starting with “keepers of the dance” and how this relates to our relationship with god. Afterwards, the girls, accompanied by Jackson Batten and Kyle Sellers on guitar, sang “Hills and Valleys”. Moms and children filled the floor as they thanked their moms and dads who support them, by singing a beautiful rendition of “When I Pray for You”. There wasn’t a dry eye in the front room of Harold’s. Gene Pope, President of Junior Shag Association, gave the farewell speech; thanking everyone for coming, all the volunteers, Monte Lee for taking pictures and until July 17-22, 2018 everyone said goodbye to a fabulous week. The OD Shag Club Dance Team was invited to dance and teach the Shag Dance July 19, 2017, at the Myrtle Beach Convention Center from 6:30PM thru 9PM Thursday night for the Honorary Society for Educators, Delta Kappa Gamma international. 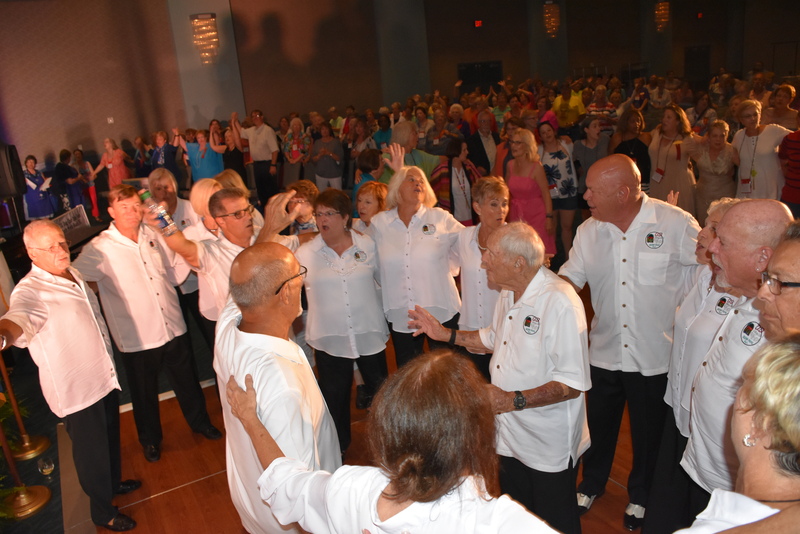 We all arrived at the Convention Center around 6:30PM and were directed to Ballrooms D/E where there were approximately 400 members of the Honorary Society for Educators awaiting to be taught to dance and listen to Craig Woolard and the Embers play. As we waited to be introduced we all where in hopes that the many hours of practice would pay off. The introductions for the educators from each state represented was introduced and the United States Flag was honored during the National Anthem. 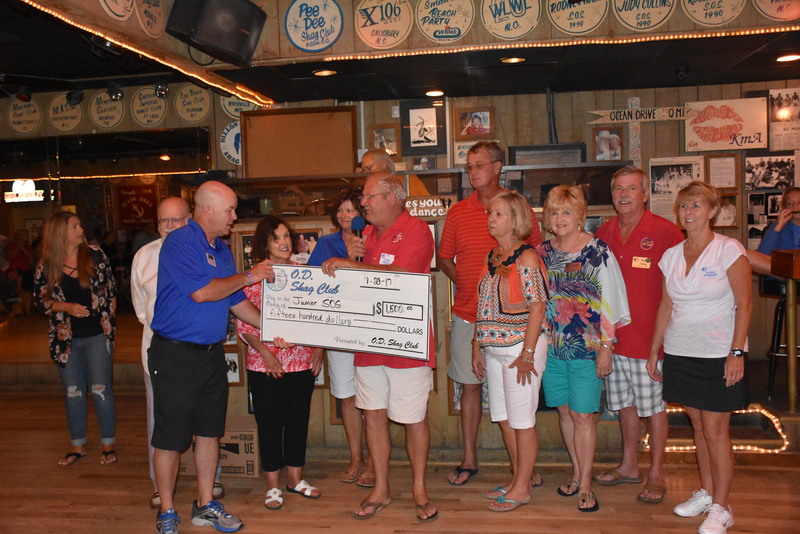 Susie Epps our point of contact before introducing the OD Shag Club Dance Team presented the Team with a generous donation then giving the microphone to the Dance Team Spokes Person Linda Campbell. Linda gave a brief history of the Dance Team and explained what we were all about. The crowed showed their enthusiasm with a warm welcome by their applause. Linda introduced the Dance Team and we had the opportunity to show case what we had been practicing for two months. Our own circle dance of six couples with eight steps and the ladies dancing with different partners after each step. The audience loved it. Even though we were unable to show case each different style of the Shag, we had more fun teaching the many ladies that where on their feet wanting to learn. We were flooded with so many of the ladies that we had several instructions going on at the same time. We had groups of 10 and 20 ladies wanting to learn. On the dance floor, those who were familiar with the dance would come on the dance floor and grab the members of the team and they danced, danced, danced. The dance floor was never empty as long as Craig Woolard and the Embers played. And the band played on until 9PM. At the end of the event Craig Woolard honored the veterans with Lee Greenwoods “God Bless America” as we honored our own Lenny Gardner and the veterans of the Dance Team. We set a record of getting the most ladies on the dance floor at one time of over 250 participants and what an evening it was. The only complaint was that the evening was too short. We accomplished what we were asked to do maybe unorthodox but very affective. The ladies took over the dance floor and strutted their stuff. I would like to thank Susie Epps for contacting the OD Shag Club Dance Team and inviting us to dance at their convention. A special thank you to the OD Shag Club Dance Team for spending their evening and their weekends for the last two months practicing to make this event one of the greatest. Linda Campbell, Dan Dasquino, Lenny Gardner, Vic Gillispie, Barbara Hopper, Rich Jamiolkowski, Cathy Jamiolkowski, Connie Livingston, Lou Martino, Bill Millman, Diane Millman, Bob Page, Helon Page, Cherie Patalik, John Setzer, Lori Setzer, Ted Sobol, Diane Tindal, Burnie Williams, Donna Williams, Linda Wilson, and Callie White. Thank you Jim Livingston for assisting with taking Photos and Happy Birthday to Diane Millman. Well another month is gone and we are in the middle of summer season. I would like to wish everyone a happy and safe 4th. Just a small reminder the July business meeting will be on the 11th. All of July events are on web site. If you missed last month’s party you missed a good one. Donnie did an excellent job cooking the fish and everyone danced and had a great time. Hope to see everyone at the fun run if not before.